‘Good morning, Mr President.’ Thabo made sure to steady his voice as he exchanged pleasantries with his boss. This morning, especially. As Chief of Staff, it was his job to broach difficult subjects with him before they became issues. ‘Morning, Thabo. How are you this morning.’ Why the heck does he want to know how I am? Sh*t f*ck! Does he know? Thabo was in a panic. He finally ran out of patience with his drinking buddy at the bar last night. The doctor said the stitches wouldn’t be obvious. Wasn’t the make-up supposed to do the magic. Thabo knew he should not have trusted that sweet-talking baldie. His security detail hushed things up, of that he was sure. But the president had spies everywhere. ‘Thabo?’ the president said. ‘Yes, very well, I’m quite fine this morning’ the flustered Chief of Staff answered. President Tshabalala was always in good spirits. To the ignorant, he came across as exceedingly charming. To those in the know however, that charm masked a very steely temperament. The man was a survivor. After the umpteenth scandal, you’d think he’d be licking his wounds in his village compound by now. It was only a matter of time before he was kicked out of State House, the Deputy President said then. The other grandies thought so too. He was still here, old wily fox that he is. When the president first told him he had nominated him to lead his staff, it was almost too good to be true. Not that Thabo Njoko was not ambitious. After all, that was the only reason he joined politics during those heady freedom-fighting days back in Varsity. It was ambition that drove him to run for the presidency of the University Students Union. He’d always thought his fellow students were a little naïve. What power did a student president who hoped to graduate have against those with the means to stop him? He’d always longed for real power to do things, change things. Top on his agenda was to change the racial mix of God’s Own Country’s economic system. This was supposed to be easy under a President Tshabalala. Well, at least so he thought. The President had been unusually slow in announcing a replacement for the outgoing Governor of the Central Bank of God’s Own Country (CBGOC). President Tshabalala raised his head slowly and stared at his Chief of Staff. The boy had some guts, you had to give him that. He’d always been irritated by how easily his ministers jumped on his every word like he was the messiah himself. Bloody wimps! But on this morning, Thabo surely didn’t choose a good time to be courageous. ‘What did you just say, Thabo?’ The president was clearly irritated, Thabo thought. ‘My apologies, Mr President.’ The Wand depreciated by 5% again yesterday. The president’s indecision on the matter was still a mystery to him. Surely, the president was not about to throw away this opportunity. Thabo had thought about what he was going to make sure the press secretary said when the appointment was finally made. They were going to rid those communists of their favourite talking point. With the finance minister and central bank governor both black, it would be difficult for the president’s opponents to continue to say God’s Own Country was still under economic subjugation. At least, so Thabo thought. Thabo pondered about the right answer. The old man usually went philosophical before a dress down. Best to keep quiet. ‘It is a simple question, Thabo’ said the President. ‘I’m not sure I see your point, Mr President. ‘Take a seat, boy!’ This was not going well. Thabo prepared for the worst. ‘Why did that bank appoint two co-CEOs, one white, one black? ‘Better still, do you think they could ever appoint two white co-CEOs?’ Thabo had many shortcomings; dullness was not one of them. President Tshabalala hoped the boy would finally learn something. After all, he could be President himself someday. ‘Now you understand the dilemma our great father faced’ said the president. Thabo was astonished at how politically immature he really was. God’s Own country could not afford the two guardians of the country’s economy to both be black. Not yet, at least. It all made sense now. When markets worried about Dr. Kruger’s upcoming departure, it was not really because they’d miss him. Of course, he’d done a fine job. In spite of the ratings downgrade and labour unrest, global market participants’ confidence in the Central Bank of God’s Own Country (CBGOC) remained unwavering. Dr. Kruger’s fine stewardship was a major factor, of course. The old fox knew that although Dr. Kruger’s deputies were more than qualified, market participants would remain jittery for a while if any one of them were appointed. The administration needed some reprieve on the economy. Not with all the other problems the president was still grappling with. *The President’s dilemma is a work of fiction. Names, characters, places and incidents either are the product of the author’s imagination or are used fictitiously. Any resemblance to actual persons, living or dead, events or locales is entirely coincidental. This entry was posted in Africa, Finance, Leadership, Race and tagged Africa, Central banks, Economics, Fiction, Finance, Markets on September 27, 2014 by rafiqraji. US troops stationed in Liberia should provide support to help make the nationwide shutdown effective. 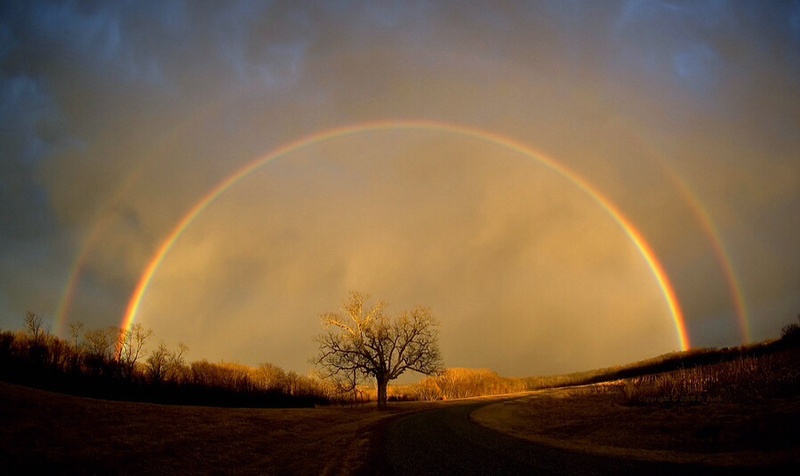 This entry was posted in Tweets on September 18, 2014 by rafiqraji. Should African SWFs be investing in local infrastructure? Sovereign wealth funds (SWFs) are all the rage now in Africa. Motivations range from the altruistic to the corrupt. 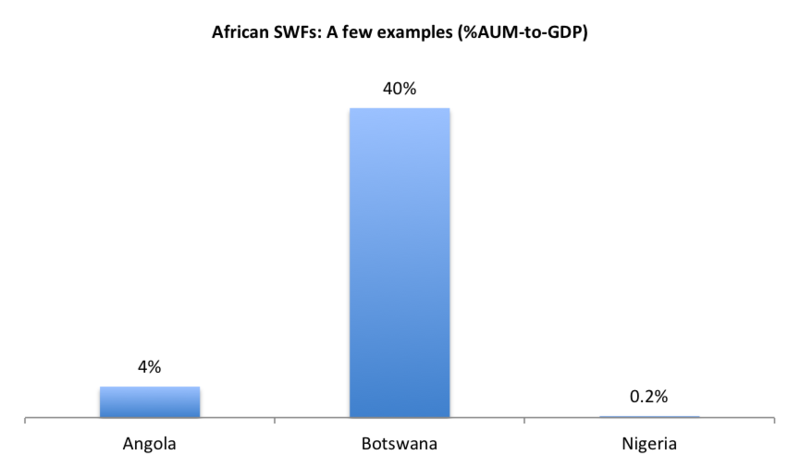 Africa’s oldest SWF is Botswana’s Pula Fund of USD5.7 bn (40% of country’s 2013 GDP), established in November 1993. Almost 20 years later in 2011, Nigeria set up its own with a paltry USD1bn assets under management (AUM), c. 0.2% of its 2013 GDP. Nigeria discovered oil in 1956, more than ten years before the huge Orapa diamond mine discovery in Botswana. Although Angola’s SWF (USD5bn AUM, 4% of 2013 GDP) is also relatively recent, having been set up in 2012, a longrunning civil war made it hitherto difficult for any meaningful development planning. Other African SWFs are Libya’s USD65bn, Algeria’s USD77bn, Gabon’s USD380mn, Mauritania’s USD300mn and Equatorial Guinea’s USD800mn funds. Ghana also set up a two-part petroleum fund in 2011 with an initial USD100mn size, now bordering on circa USD0.5bn or higher when USD250mn from the USD1bn proceeds of its recent (Sept 2014) and third Eurobond are put into a planned infrastructure investment fund in January 2015. While SWFs are not a recent phenomenon – even in Africa as the Botswana case demonstrates, the current debate is about what they really are. This is in light of the relatively broader mandates of the recently set up African ones, especially those of Nigeria, Angola and Ghana. Are they extra-budgetary structures? Are they development banks? Are they conduits for corruption? Do they create a moral hazard? Are they stabilization funds? Should they be investing in local infrastructure without cash payoff prospects? Are they fiscal authorities? Many questions, and there are plenty more. I’ll focus on just one: should they be investing in local infrastructure? My understanding of what SWFs are is simple. It is akin to a savings account. A country decides to save some of its finite wealth to ensure it remains wealthy for a very long time. It took a while before the oil-rich African countries of Nigeria and Angola decided to set up SWFs. Ghana, whose 2010 oil discoveries are relatively recent, chose to put in place a framework that it hopes would prevent it from wasting its oil wealth like its big neighbor, Nigeria, did. The SWFs that Nigeria, Angola and Ghana (to be launched in January 2015) have set up include infrastructure funds aimed at investing in local infrastructure. I can’t help but wonder about the wisdom in having a supposed nest egg invest in precisely the things it was set up not to spend money on. Of course, investing in infrastructure is a good thing. But that is what budgets are for. The whole point of setting up a savings account is to keep some money away before you spend everything. I doubt you’ll ever find someone who couldn’t find something to spend money on. This is why we save. We save so that we don’t spend ourselves to penury. When a country’s savings account – its SWF – decides to be a “special” current account, then we have a problem. The fundamental question I have about an African SWF (note emphasis on African) investing in local infrastructure is this. Where is the payoff going to come from? Fundamentally, an SWF – no matter how complex or altruistic its philosophy – is fundamentally an investment fund. It must earn a return. And I doubt very much that the Nigerian, Angolan and Ghanaian SWFs are investing in local infrastructure for its asset class characteristics. Ordinarily, the long-term and cash flow characteristics of infrastructure investments make them suitable for some allocation in the portfolios of SWFs or any long-term horizon fund. If that were the reason for the African sovereign infrastructure funds, it would not be an issue since the return and diversification objectives would be clear. Let us assume that a country’s SWF could find as many local infrastructure projects to invest in, whether directly or indirectly through a privately-led fund. Let us further assume that these projects are properly structured – like they would in a private or PPP arrangement – to ensure investors make a return from tolls, power rates, etc. Wouldn’t this though amount to additional taxation? Essentially, you move money from one pocket to another pocket in the same pair of trousers. And any new money that enters either pocket comes from those who you are supposedly keeping the money for. Whether a government’s revenue is from a natural resource or through direct taxation of its citizen, it is still taxation. Earnings from mineral wealth that are kept in government coffers for spending on the supposed needs of the citizenry, society and the state is money that could have gone directly to citizens of the country. So it is taxation. It is their wealth after all. If a government decides to put some of this wealth away by setting up SWFs, does it then make sense that the returns that build up that wealth come from the same citizens? The scenario discussed above assumes that these SWFs have a universe of return- earning infrastructure assets to invest in their respective countries. Well, that is not the case. African PPP projects continue to suffer tremendous pushback from local populations. Probably in realization of these, the funds in question extended their infrastructure investing mandates to include other African countries. I put these concerns to Jose Filomeno dos Santos, the chairman of Angola’s SWF and Mona Quartey, Ghana’s deputy finance minister, at the Chatham House African Sovereign Wealth funds conference held in London in September 2014. While highlighting the social imperative of investing in local infrastructure, Mr dos Santos’ answer included a description of how his country’s fund plans to ensure these investments pay off. These were along the lines of how a typical infrastructure fund makes returns and included talk of a social return. Mrs Quartey’s answers were also along the same lines, albeit I got the impression Ghana simply wants to build its infrastructure. I think the reasoning behind the Nigerian case is the same as well. The Santiago principles also got mentioned a lot. My simplest interpretation of their answers (or reasons) goes like this. We don’t have infrastructure, we need to invest in infrastructure. That is all very well. But, is that the job of a sovereign wealth fund? This entry was posted in Africa, Finance, Nigeria and tagged Africa, Angola, Botswana, Finance, Ghana, Nigeria, Sovereign Wealth Funds, Wealth Management on September 14, 2014 by rafiqraji. This entry was posted in Tweets on September 12, 2014 by rafiqraji. Last week in London, I overhead someone saying with derision: “who gives a sh*t about Ebola?” He then picked up the phone to call his wife and kids. He is French, I could tell from the accent. I bet he would not have been so flippant if his loved ones were at risk of the epidemic. I doubt Ebola would be another issue to analyze and engage in jocular banter about if his friends and compatriots were falling sick, dying and not having the dignity of a proper burial. And maybe my French friend should not feel too safe about Ebola. But before I go up in arms against the French, I’m reminded that the one organization that has been really selfless in helping deal with this Ebola outbreak is French. Well, at least the French founded it. The international community should take a cue from Medicins Sans Frontieres (MSF). Hitherto, the international response has been slow and not proactive. Some of the measures now being taken could have been implemented much earlier when the outbreak was still in its infancy. On Friday 07 September 2014, the United Nations (UN) announced plans to set up a crisis center to co-ordinate the global response. Couldn’t this have been done much sooner? 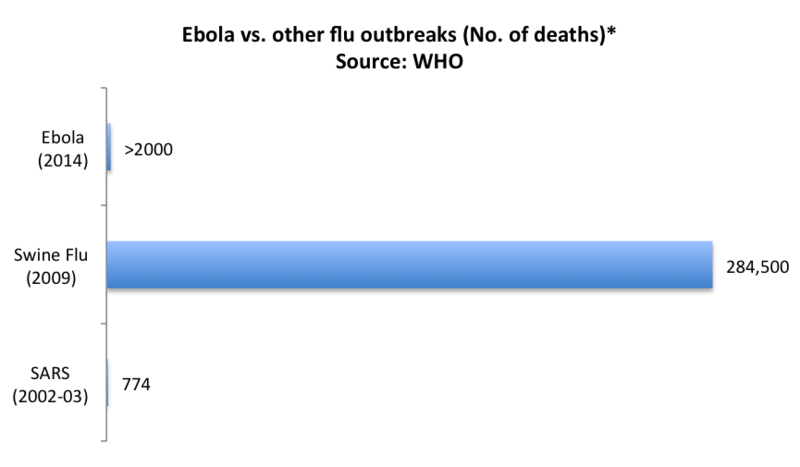 The Ebola outbreak became a crisis of significance in May. Some would argue much more proactive steps should have been taken as early as March when authorities in affected countries started being upfront about cases. In any case, it is not too late to change the tone of the global response. *Relatively recent flu outbreaks. The fatalities of much earlier influenza epidemics were higher. The “Spanish flu” killed 50-70 million people in 1918. Forty years later, in 1957-58, the “Asian flu” killed 2 million people. The international business community with interests in Ebola-affected countries has also been relatively mute about the outbreak. They have not provided as much charitable donations as they should. Those with influential voices have not lent their influence towards helping ease fears and knee-jerk reactions that exacerbate the economic costs to these countries. Airliners and shippers who make substantial revenues from the region have also not been creative in their precautionary steps. I mean, if such crucial supply chain actors decide not to fly or ship to these countries, how else then would help reach those in need? The French government advised a major French airliner to suspend flights to Sierra Leone in August. As I recall, they didn’t contemplate such steps during the Asian 2002-03 SARS (774 deaths) and 2009 swine flu (284,500 deaths) outbreaks. What airlines did was to ask for “fit-to-fly” certificates. While that may be difficult in the African case in light of its weak health infrastructure, there are creative and effective alternatives. Ebola screening can be done inexpensively at ports. For example, one German shipper – you have to admire the Germans! – has taken a much more reasonable step. It increased its rates to include costs for Ebola screening of cargo and passengers. That makes more sense, I think. More importantly, institutions that have been doing business on the continent for decades – more than a century for some – have a social responsibility towards the people that have helped their businesses flourish all these years. Fear and panic would be reduced when reputable institutions provide objective assessments and advice on the outbreak. Consequently, these reduce the economic costs to the affected countries. A recurring question from the international business community remains about the quantification of these economic costs for countries like Sierra Leone, Liberia, and Guinea. These are countries that were hitherto on a rebound on the back of mineral wealth – mostly iron ore. The African Development Bank (AfDB) thinks GDP growth reductions could be in the range of 1-4ppt for these countries. Other economic costs are related to inflation on the back of supply chain disruptions. Quoting AfDB President Donald Kaberuka’s remarks to Reuters on 27 August 2014: “Revenues are down, foreign exchange levels are down, markets are not functioning, airlines are not coming in, projects are being cancelled, business people have left – that is very, very damaging.” I doubt the current economic situation could be better put than that. But then, is it the Ebola virus disease that is really responsible for all these or fear and panic by the international business community? As at 05 September 2014, there were 1,146 confirmed Ebola cases in Sierra Leone. That is just 0.02% of its 6 million population! If we even assume the WHO worst-case scenario of 20,000 cases for all three countries combined, that would still just be 0.09% of the combined 21.6 million populations of Sierra Leone, Liberia and Guinea. To be fair to business, most of the prevailing analyses of the crisis have been alarmist, incompetent even. To ease international business fears, more reputable institutions should lend their voices to the crisis like the AfDB has done. On Friday, 06 September 2014, the UN Secretary-General (UNSG) Ban Ki-moon did just that, urging airlines and shipping companies not to suspend operations to affected countries. Quoting the UNSG: “Banning flights and shipping services will not keep Ebola from spreading, but it will keep medical teams from reaching people most in need…stigma and rumour can do just as much damage as the virus itself. It is crucial to remember that Ebola can be avoided and controlled.” For fellow Africans, I’ll simply say: this one too will pass. Views are mine and not of any institution(s) I may be affiliated with. This entry was posted in Africa and tagged Africa, Ebola, Economics, Guinea, Health Epidemics, Liberia, Nigeria, Sierra Leone on September 7, 2014 by rafiqraji.